The Ramsey 12V DC Patriot 9500 UT Winch has a unique feature that saves time for self-recovery with Ramsey’s Patented Semi-Automatic Clutch. Simply rotate the clutch handle, pull out the cable, attach it to an anchor point; then press the wireless remote from the anchor point and the winch automatically engages the clutch and begins pulling in the cable. (During team events the wired remote can be used by the driver, when the signal is given that the cable is secured to the anchor point, the driver can begin winching without ever leaving their seat.) 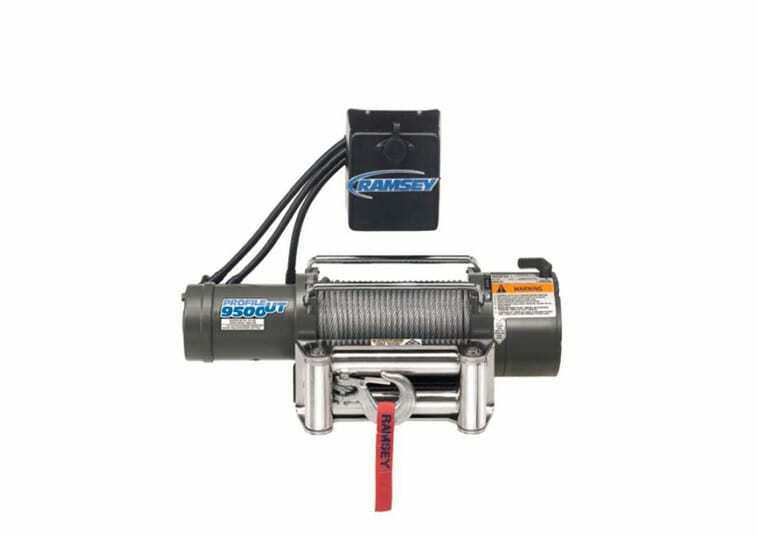 This winch includes 105 ft. of 5/16” galvanized aircraft cable with replaceable clevis hook and has all the dependability that off-road enthusiasts have come to expect from Ramsey Winch. The Patriot 9500 UT is built rugged and strong with 9,500 lb. line pull using Ramsey’s proven and efficient three-stage planetary gear system.